Well hello there! After a 10 day whirlwind it feels great to be back and ready to recap the latest (and greatest!) 10 x 10 Challenge! I honestly can’t believe how fast this one flew by but I had an absolute blast hosting with my girl Caroline of UnFancy once again. This round left me feeling particularly invigorated and oh so proud of how this weird little exercise is finding its way into wardrobes all over world. The energy and enthusiasm for the #Winter10x10 was exceptional and hard to put into words but I’m extremely grateful that so many of you stepped outside your comfort zones to join in, whether it was your first or fifth or tenth challenge. It was wonderful to see people from all over the globe sharing a peek into their lives, style and personalities. So here’s a huge THANK YOU to all of you, for joining in, spreading the word and sharing the positive vibes with the 10×10 community, it would not be nearly as fun or as important without each and every one of you! My 10 items and the 10 outfits I created. Top Takeaways from the 10×10 Community along with some of my favourite posts and quotes. 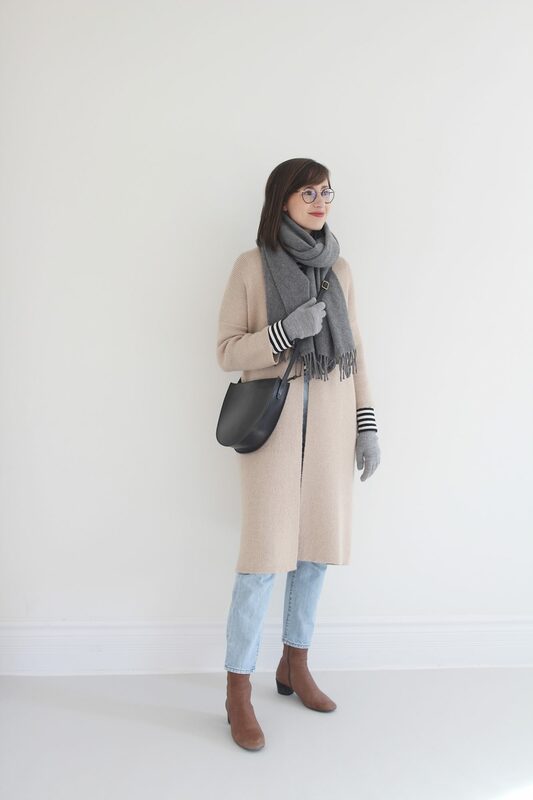 Here are the 10 pieces I wore for 10 days straight. 1 – STRIPED TEE – Emerson Fry – Sold Out – Made in USA – Similar option here. 2 – CALLY BOOT* – c/o COCLICO – $435 USD – Made responsibly in Spain – I’m a US 7 and have the 37.5 which fit snug at first but relaxed with wear. 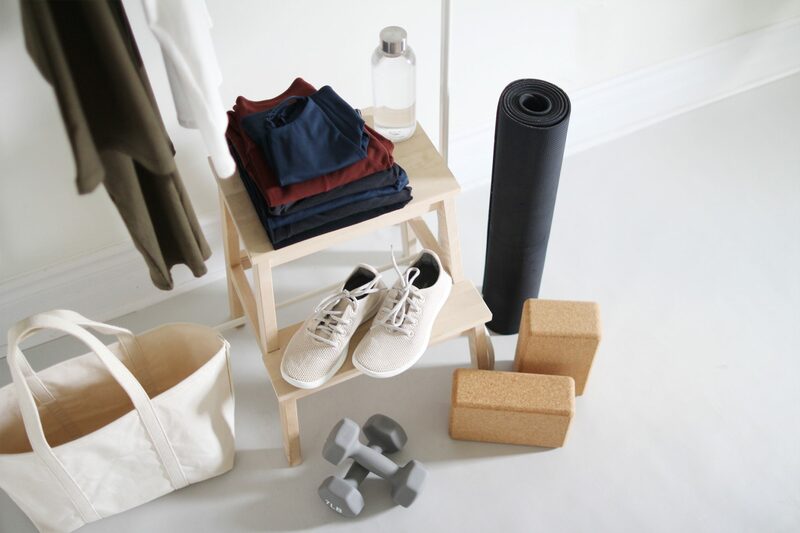 – *Save $20 at Garmentory when you sign up here. 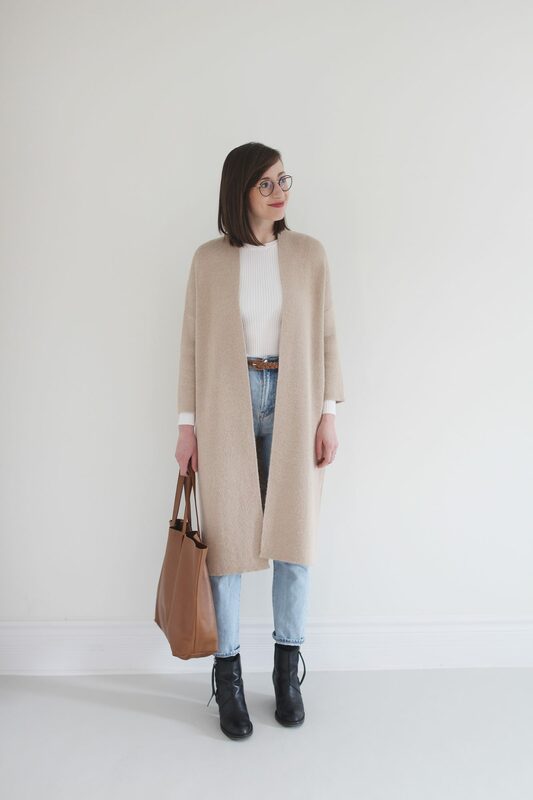 5 – LONG CARDIGAN – Han Starnes via Garmentory – Sold Out – Made responsibly in Peru. | Similar option in Black here and Grey here. 9 – WHITE RIBBED BODYSUIT – The Bodysuit of Barcelona – Sold Out – Made responsibly in Barcelona – Spring collection launching soon! Here are the 10 outfits I created with my 10 items. Accessories and coats were extra. 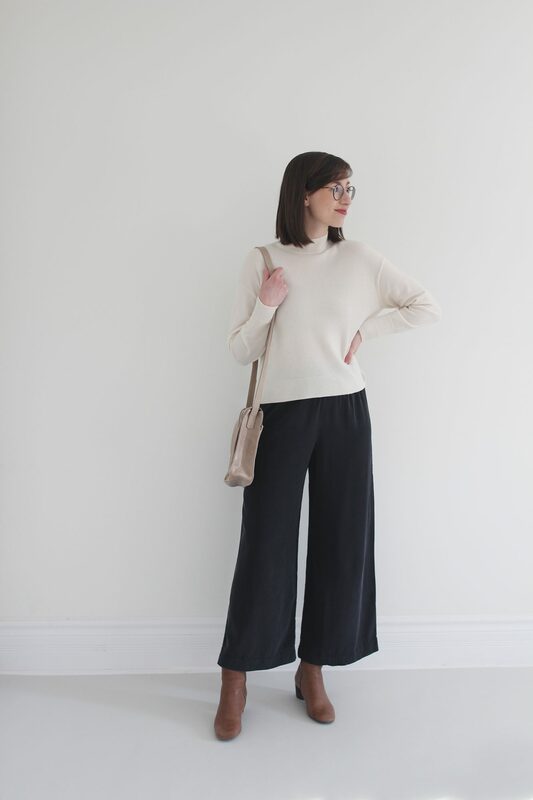 BAGS: Paprika Half Moon (c/o The Stowe currently on sale for $273 CAD!) 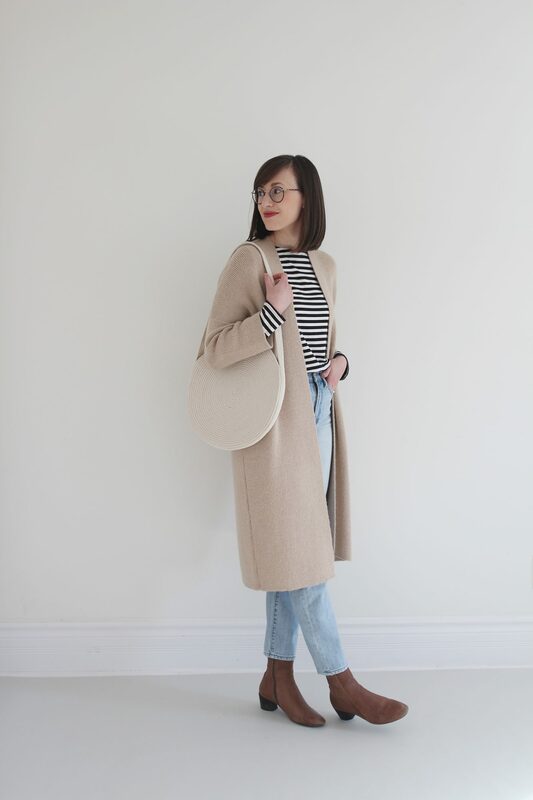 | Grey Cross Body (c/o ABLE currently on sale for $108 USD) | Oxblood Cross Body (vintage) | Caramel Tote (Cuyana $175 USD) | Circle Rope Tote (c/o APPRVL $82 USD) | Grey Wax Canvas Bag (HOI BO $480 CAD) | Black Half Moon (The Stowe $417 CAD) | All responsibly produced. 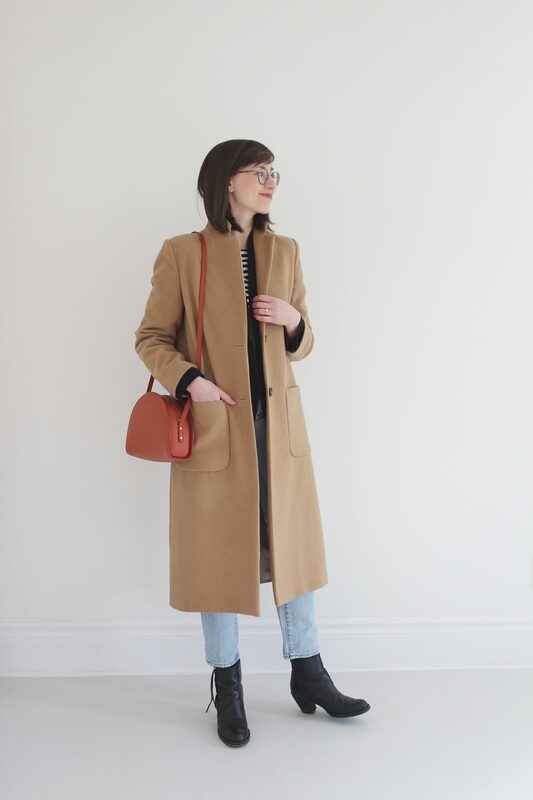 COATS: All the coats I wore this challenge are either no longer available or vintage. Instead of going into agonizing detail on every outfit, I thought it would be interesting to change it up and look at my 10×10 as a whole this time. 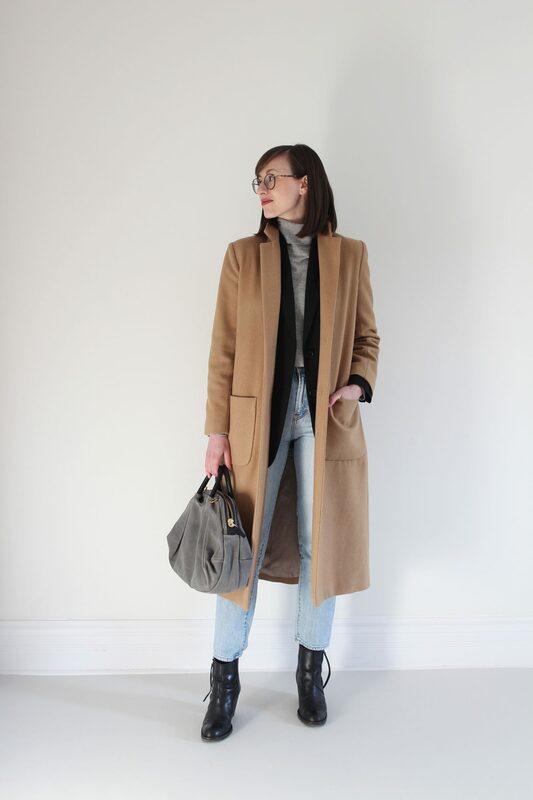 My looks were all very simple and followed the same outfit formula with very minimal styling or accessorizing so it seems like a good opportunity to assess the bigger picture instead of the nitty-gritty. So here goes! 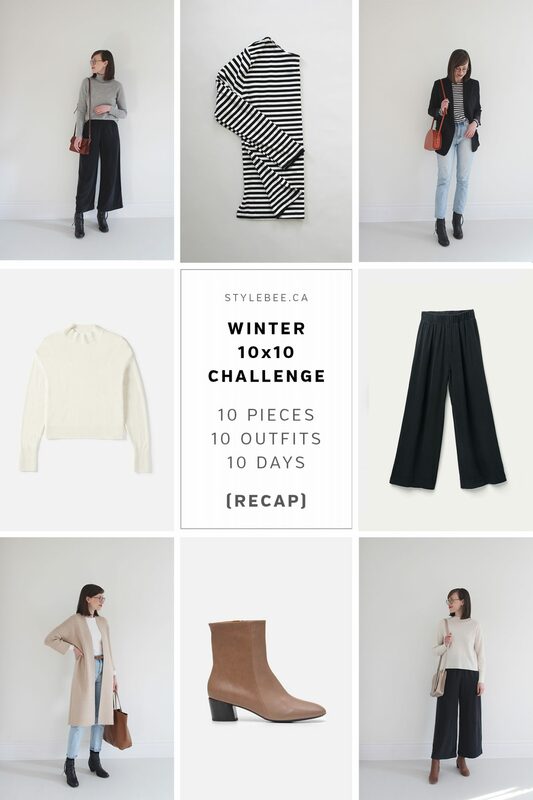 1 | What was your #Winter10x10 Challenge goal? Did you achieve it? OH YES INDEED! This was easily my most comfortable, practical for day-to-day and weather-ready 10×10 Challenge I’ve ever done. 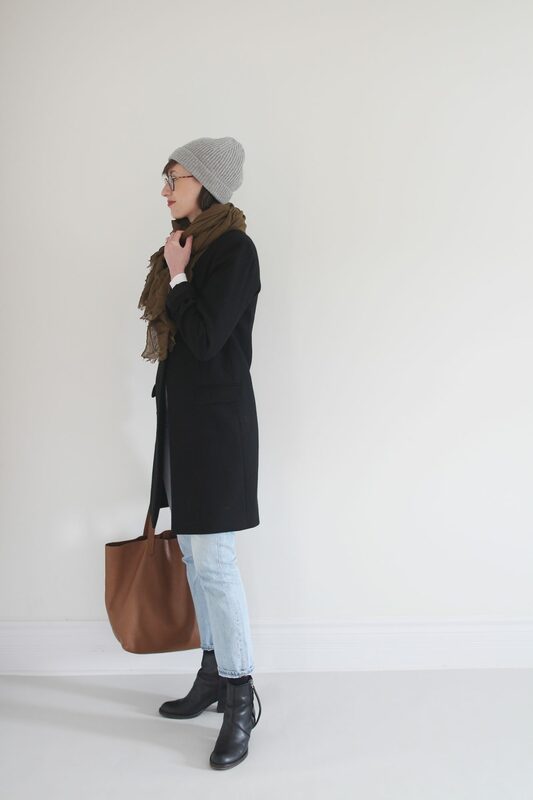 Plus, despite prioritizing comfort I never felt under dressed or as though I couldn’t express my style effectively. It was a real eye-opener for me in terms of how I qualify items in my closet. 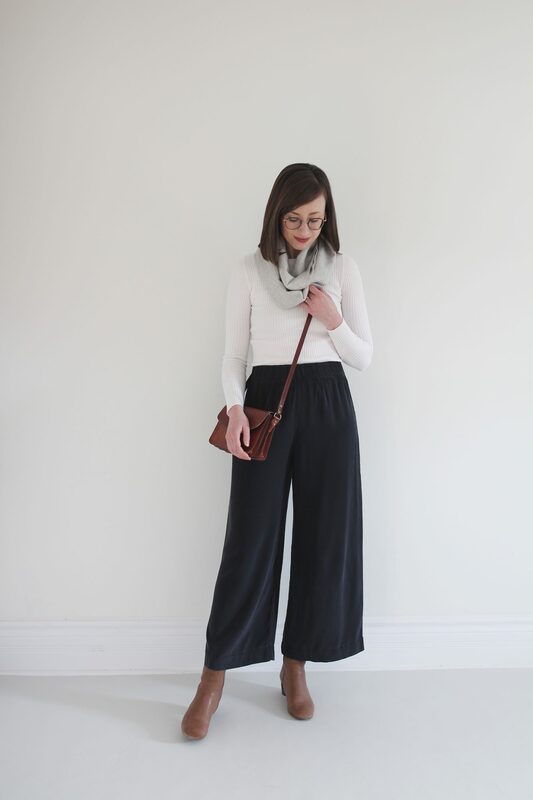 Suddenly a super relaxed item like my Perfect Summer Jeans seemed totally appropriate to wear to a collaboration meeting, while on the other hand something I’d normally save for special occasions like my silk Florence Pants felt like fair game for a lazy Sunday at home. A | Very clean and minimal in their design. This makes them really easy to mix and match and also adds an inherent element of refinement and elegance. B | Well fitting on my body type, ie: not too tight, not too oversize. 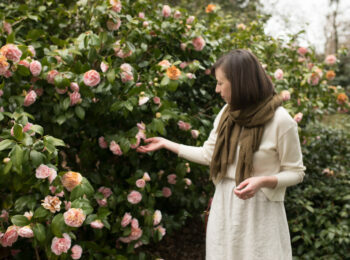 C | Made of fabrics with natural movement and drape. 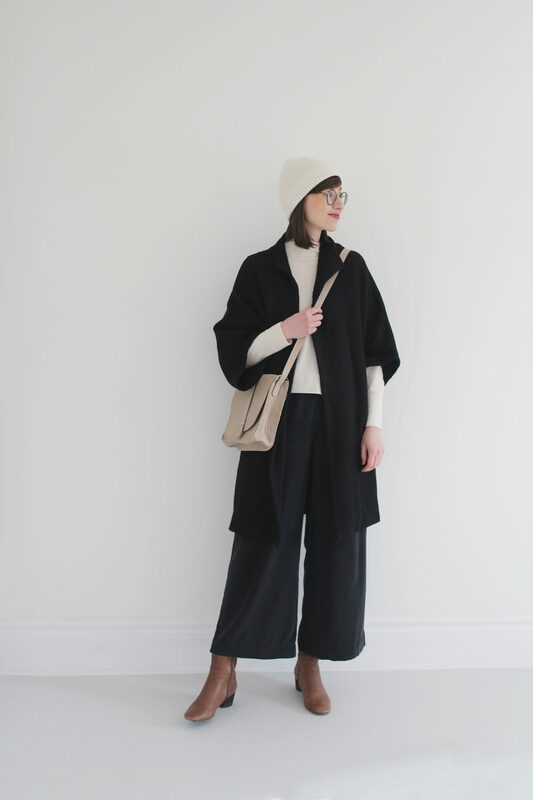 Silk, cashmere and jersey all feel fabulous on and they also move with me, which keeps a relaxed fitting piece from feeling too bulky or big. D | Subtle structure. 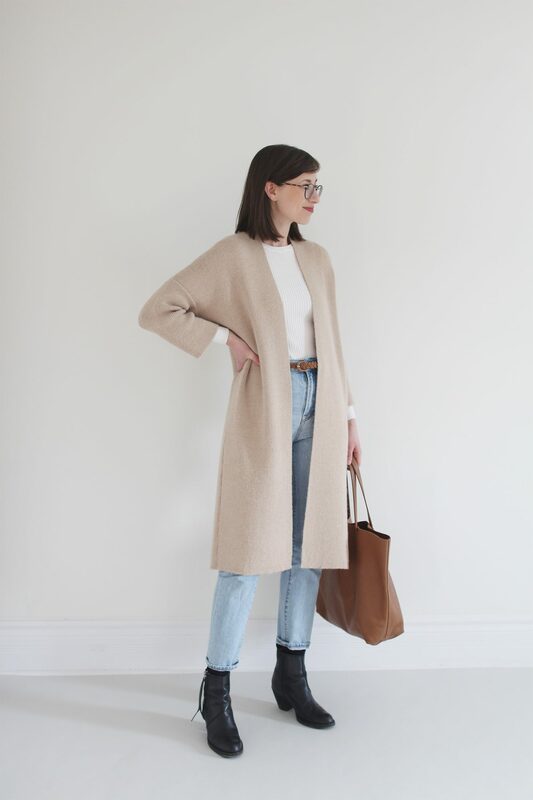 Whether it’s a classic piece like my boyfriend blazer or something less obvious like a long cardigan with sharp lines, these slightly structured elements keep the look feeling clean. I’m more at ease with my personal style than ever before. | I used to go into 10×10 challenges feeling like I had to set the bar for style innovation and really push myself to try new pieces and be super stylish. This self-imposed pressure was giving me major anxiety but over the last couple of rounds I’ve decided to just wear what I’m drawn to. I simply plan out looks I’d put together even if I wasn’t taking photos to share with thousands of people. 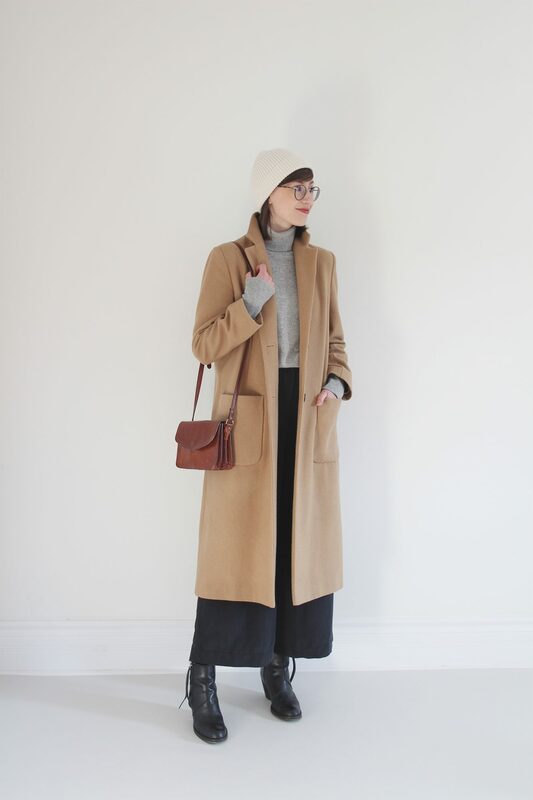 The result has been a huge relief of style and social media anxiety and I think my outfits have been even more well-received because they’re that much more wearable for most people. I’m feeling ready to put together a proper capsule closet. | Seeing how well these pieces worked together and how much I liked the looks gave me the boost of confidence I need to be excited about a 3-month capsule that I’m building for the west coast. I have lots of pieces in my closet that I can use to build similar silhouettes with tons of versatility. 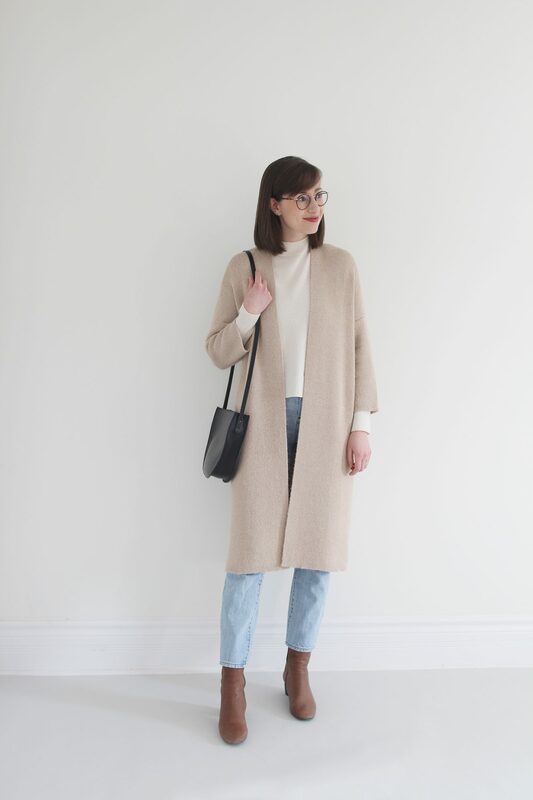 You know, I think it’s technically a tie between my jeans and my long cardigan but I’m going to give the title to my cardigan because I wore it literally every day of the challenge. 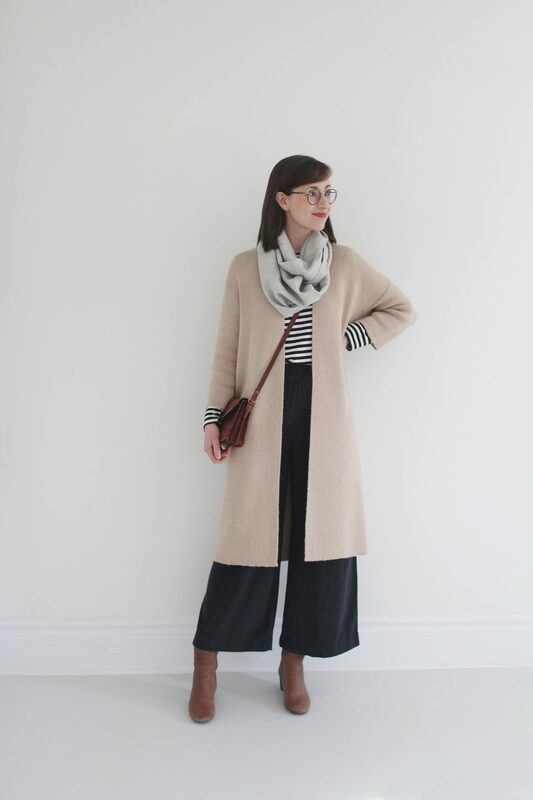 It’s also such a special piece in my closet and a true ‘investment’ knit. I hope to be wearing this one ten years from now, whereas I know the jeans won’t be around that long. That said, I must declare that my Florence Pants were my ‘favourite’ piece from the challenge. I just LOVE wearing them so much. Nope! 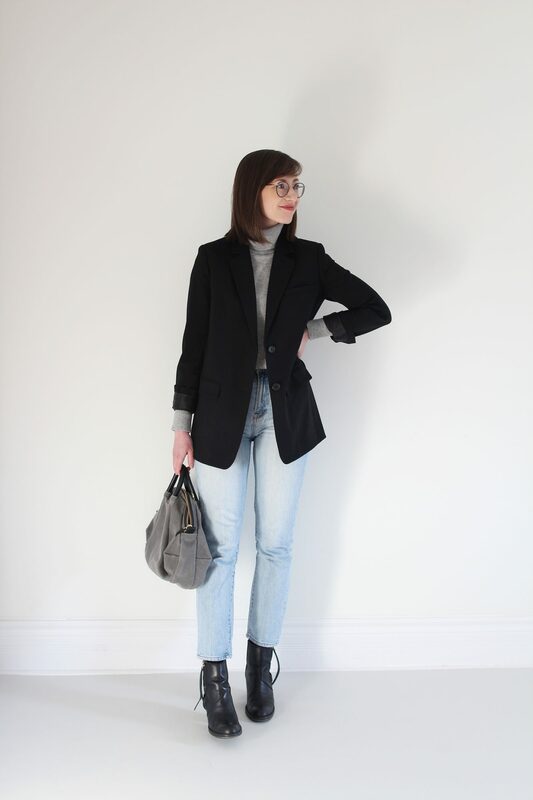 My grey turtleneck sweater went under appreciated but it was still a very versatile piece. 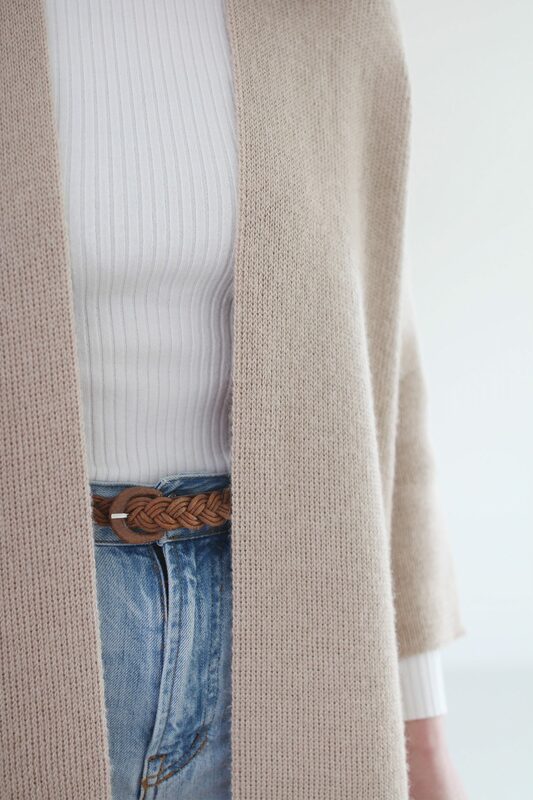 I think I opted for my ivory crop sweater more because I wanted some contrast (to my jeans and silk pants) and because it can be worn out or tucked in more easily. I’m so glad I had my boyfriend blazer on hand for meetings and dinners out because it added an instant dose of classic-chic to any base. My Pistol Boots felt a bit dated and heavy this time around but I think that’s mostly because my Cally Boots are so sleek and fitted. 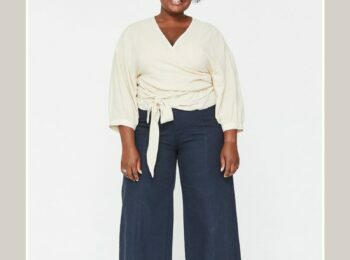 I love how those look with both my wide leg pants and my straight leg jeans, whereas my black boots felt a touch on the bulky side. They were! That said, I really lucked out with weather for most of this challenge. It was unseasonably warm (2 C) for most of the 10 days and on the ones that were super cold (-10 C) I just grabbed my winter boots and parka for dog walks. 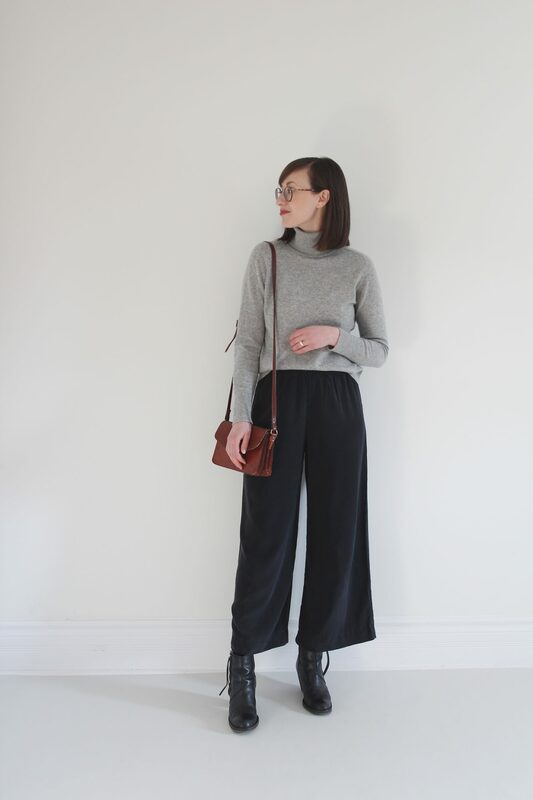 A lot of people asked about my Florence Pants in the cold and honestly, they were totally wearable, even down to -5 C. Wearing a long coat over top and wool socks underneath kept me plenty warm enough to go out. I wouldn’t have opted to be outside for hours on end but going to a from downtown or in and out of a car it was no big deal! 6 | How was laundry? So easy! I washed my bodysuit and striped tee after every wear (they just go in on delicate with my gym clothes or pjs) but my jeans don’t get washed much and I wore a base layer under my sweaters on the first day to keep them fresh for a second wear. Now I’ll either hand wash or dry clean them depending on my schedule before we head out west. My silk pants stayed clean and relatively wrinkle free thanks to hanging them up at night so I didn’t feel the need to wash or iron them. I’ve also noticed that I take much better care of my clothes during challenges. Meaning, I actually hang my jeans and jackets up right after wearing them, I fold my sweaters neatly and I wipe my boots off each time they get dirty. I keep my accessories handy and organized, my bags are hung on my clothes rack instead of abandoned on chairs or desktops. 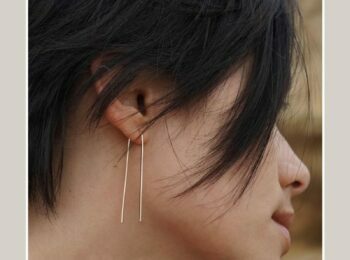 Knowing I need pieces to be wearable for longer encourages me to look after them better. This means fewer washes are needed, less ironing is required and my pieces are ready to go for the next morning. It’s also so nice to wear something that’s been placed neatly on a hanger and not left in a heap on the top of my hamper! 8 | Were any looks outside your comfort zone? Not really. 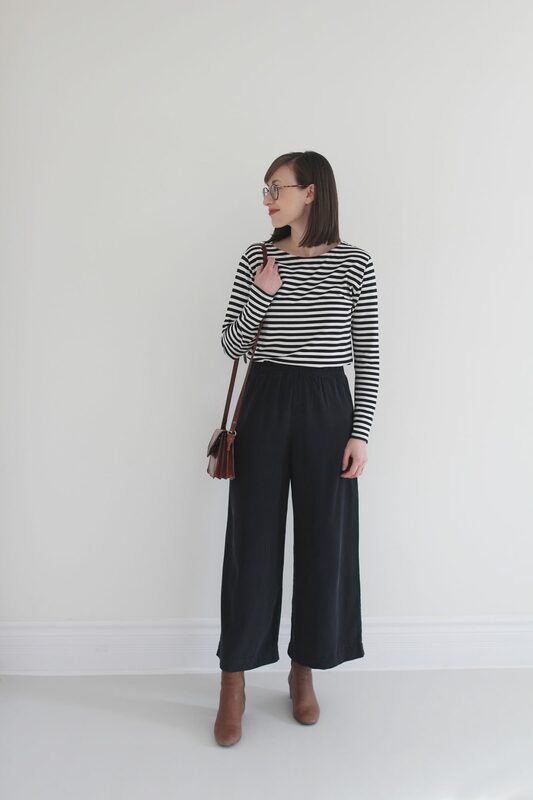 I felt totally at ease in every outfit but I was pleasantly surprised by how well my striped tee and Florence pants worked in Look 5. I’d have NEVER worn those two together otherwise. If anything I think this challenge was my ‘safest’ one yet. Meaning, I didn’t really pick any items that would push my styling abilities or force me to test new silhouettes. 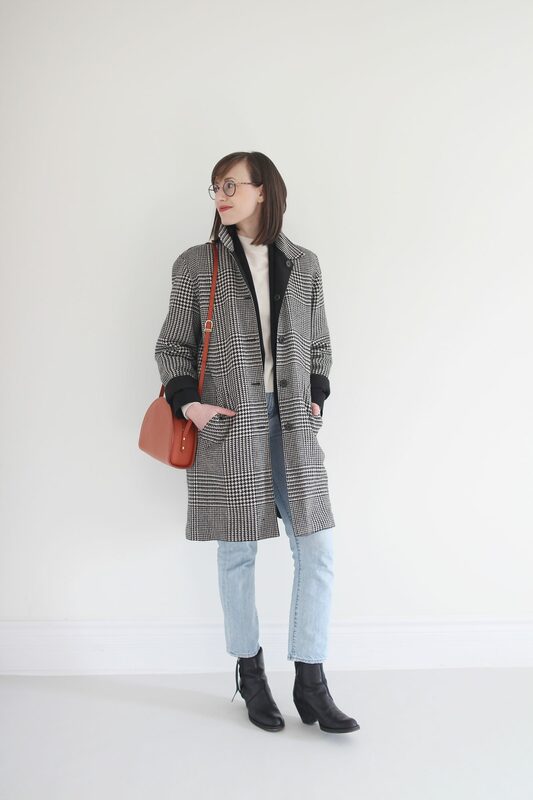 That’s okay though, I was focused on embracing my comfort zone this time around and maybe in the Spring I’ll pick some pieces that get my sartorial blood pumping a little harder. 9 | What items didn’t get paired? I never wore my Boyfriend Blazer with my Florence Pants. This was a conscious decision because I don’t feel like those two items really work together. They’re different shades of black and the styles just don’t really jive in my mind. I did try them on together but immediately swapped the blazer for my cardigan. 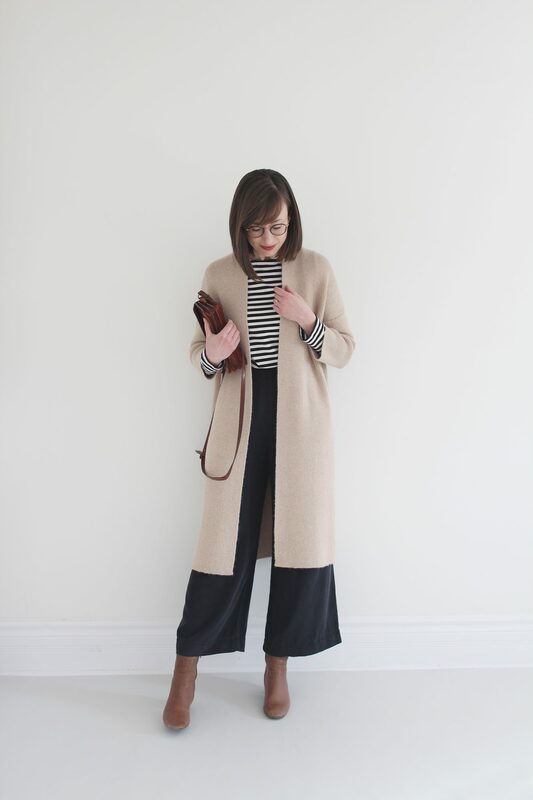 I have worn my Florence Pant with other blazers in my closet though! 10 | What was your favourite outfit? Why? Ah! 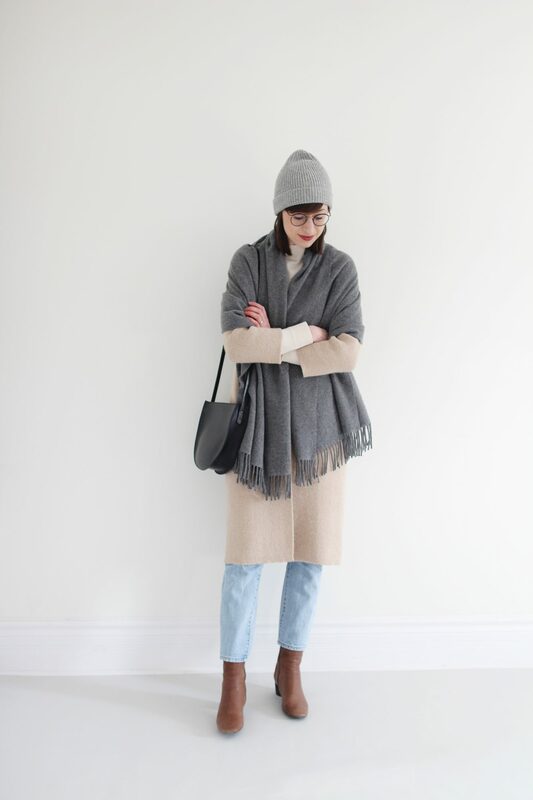 This one is a really tough call but I think I’ll have to say LOOK 10 is my favourite because I just love the colour palette and how well it exemplified my challenge goal to embrace comfy-chic. LOOK 8 and LOOK 1 are also outfits I would gladly repeat anytime! Overall, the looks from this challenge are probably my most wearable and repeatable to date. They all worked really well for my lifestyle, schedule and activities so I would, and will, gladly wear most again. Woohoo! I’m so glad I decided to do this! I was worried my clothes weren’t stylish enough or that my photos wouldn’t be good enough or that I wouldn’t like how I looked enough but I decided to do it anyway and it was so fun! Getting ready each day is such a breeze! 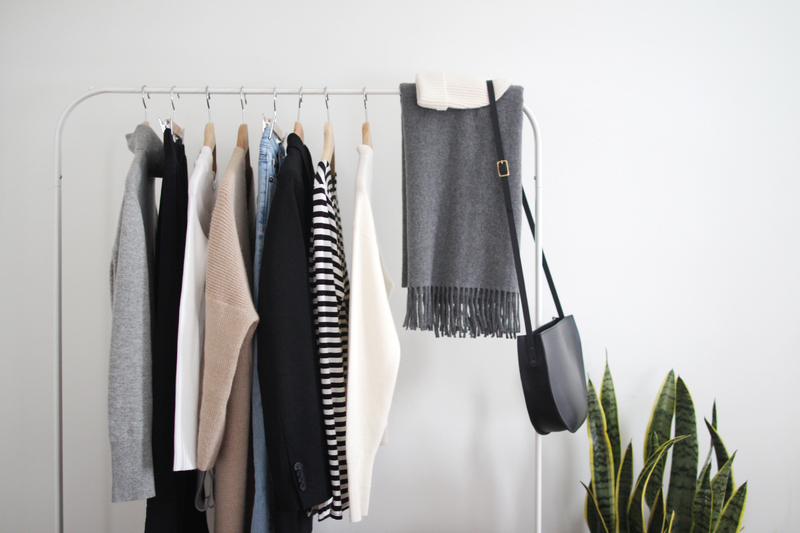 Having only 10 items to choose from makes putting outfits together so much simpler than when you’re staring at an entire closet of clothes. 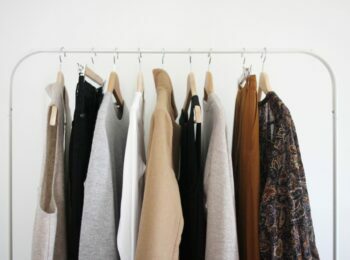 Knowing what I’m going to wear relieves so much decision stress in the morning. 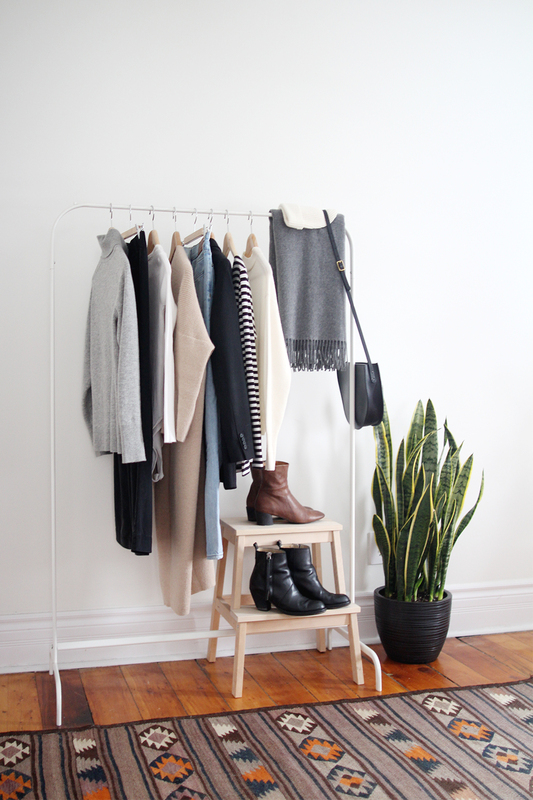 I have a much clearer sense of my personal style and what I need to round out my closet. This was the biggest takeaway I had when I first started the 10×10 challenge. It’s so refreshing to feel like you’re finally getting to know what works for you and what you feel good in. 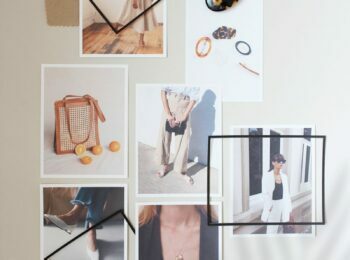 Suddenly, trends and ‘must-haves’ lose their impact when you have a clearer idea of what your style really is. I am surprised by how many outfit combinations I was able to create with these pieces. We’ve been so predisposed to buying and adding new things all the time, we forget that our clothes can work a lot harder than we make them. I met so many lovely people through the #10x10Friends community! This is my favourite part about the challenge and, I believe, the critical reason behind its growth and success. 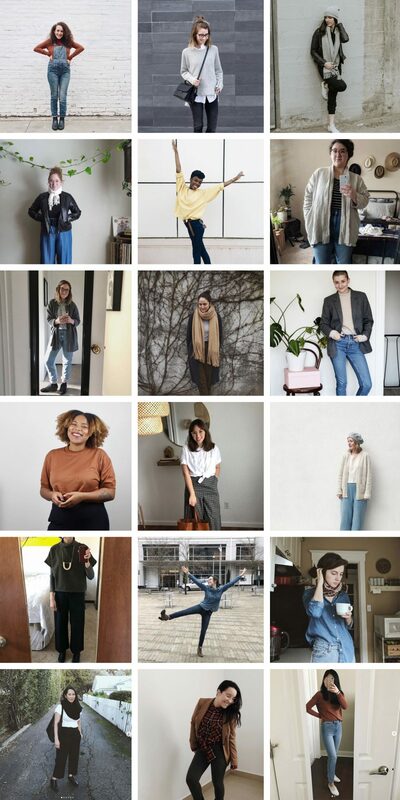 Personally, I don’t have a lot of friends who are as interested in slow fashion or personal style as I am so it’s been an absolute delight to connect with other people who love this stuff as much as me! Taking outfit photos is tough! This one starts to come up a lot around the midway point and I get it, trust me! This element of the challenge is always a hurdle but it’s a crucial part of the process. Not only to see how the outfit looks but to own it as part of the person you’re putting out into the world. It also really helps to see all your looks together at the end! 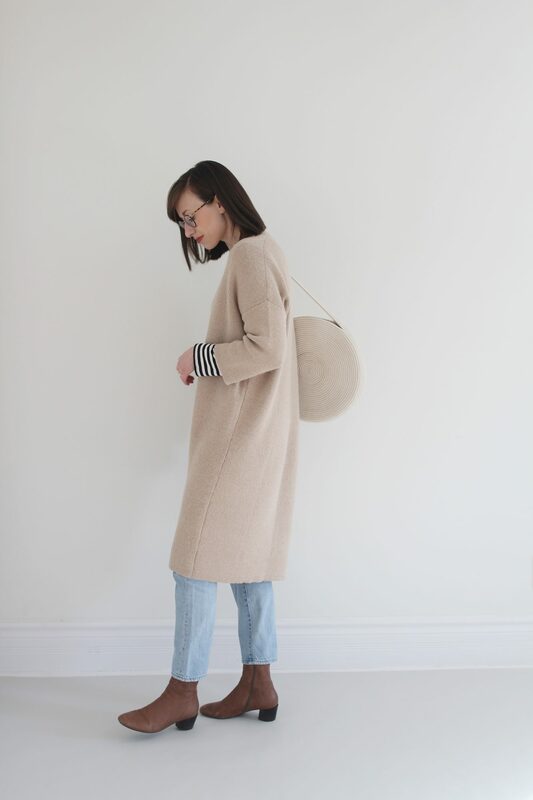 Exploring personal style is a privilege but not at all pointless. I noticed this sentiment a lot this time and it was an important reminder. We are so lucky to be in a position in which we get to spend time, effort and money on clothes we like. Much of the world does not have this privilege. But that doesn’t make our appreciation for style a frivolous matter. In fact, I think it’s more important now than ever to be thoughtful about our consumption and how our choices in what we buy influence our lives. Here are some of the lovely #10x10Friends who stood out to me this round but honestly, I could have created 10 of these grids! As always, reading your insights and feedback on the experience is so much fun! WELL FRIENDS, THAT’S A WRAP ON THE #WINTER10X10 CHALLENGE! WE HOPE YOU’LL JOIN US IN THE SPRING! I’D LOVE TO HEAR ABOUT YOUR 10×10 CHALLENGE! WAS IT YOUR FIRST TRY? IF SO, HOW DID YOU FIND IT? DID YOU MAKE IT TO THE END OR CALL IT AFTER A FEW DAYS? No judgement! WHAT WAS YOUR FAVOURITE ITEM OR MOST UNEXPECTED TAKEAWAY? HAVE A QUESTION ABOUT MY 10×10? 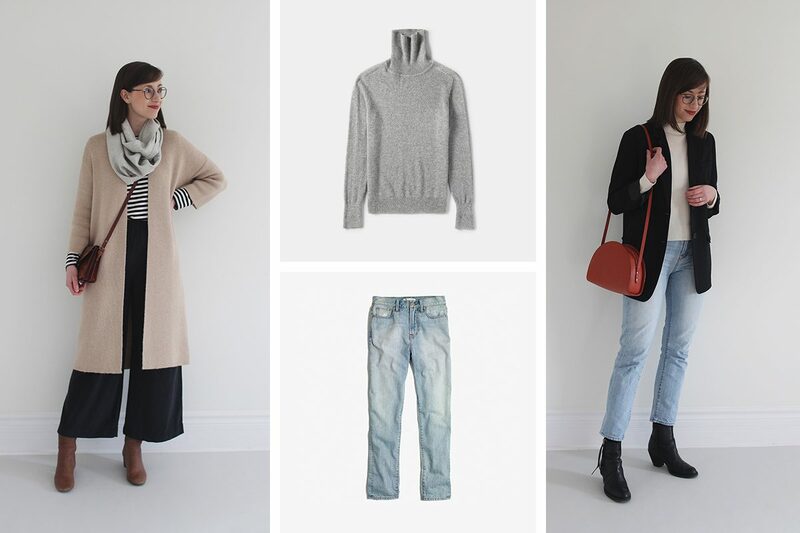 Hi, lovely ensembles! Is your FashionAble saddlebag grey or petwer. The colour of your bag is lovely, but the current ‘grey’ bag on the website looks so dark. Thanks! 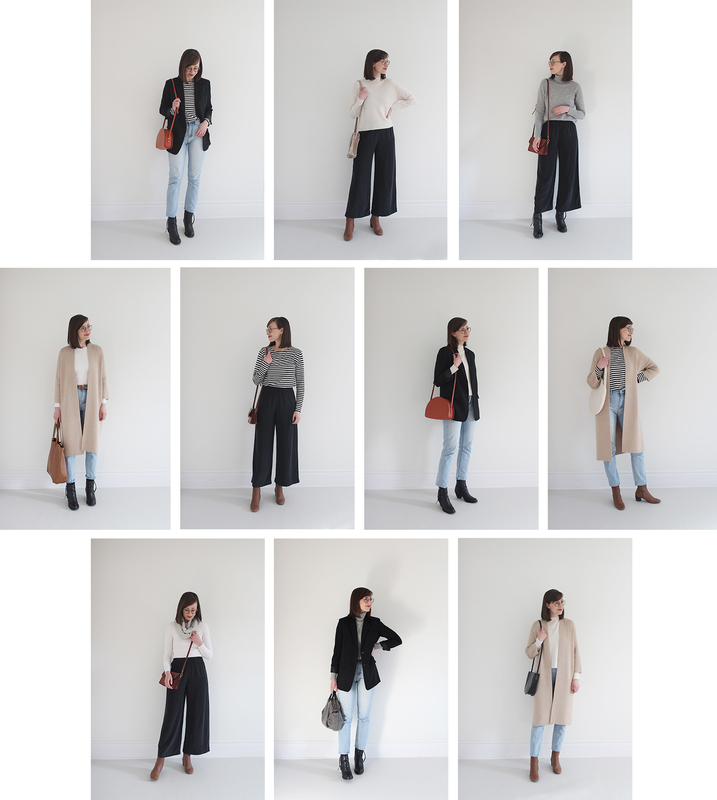 Hi, lovely ensembles! Is your Fashionable bag grey or pewter? Your bag is a lovely colour, but the current ‘grey’ on the website looks so dark. Thanks! Where is that braided belt from? It’s EXACTLY what I’ve been looking fir! I did 7 days but did not make it to the end 🙁 HOWEVER, I still learned a lot! 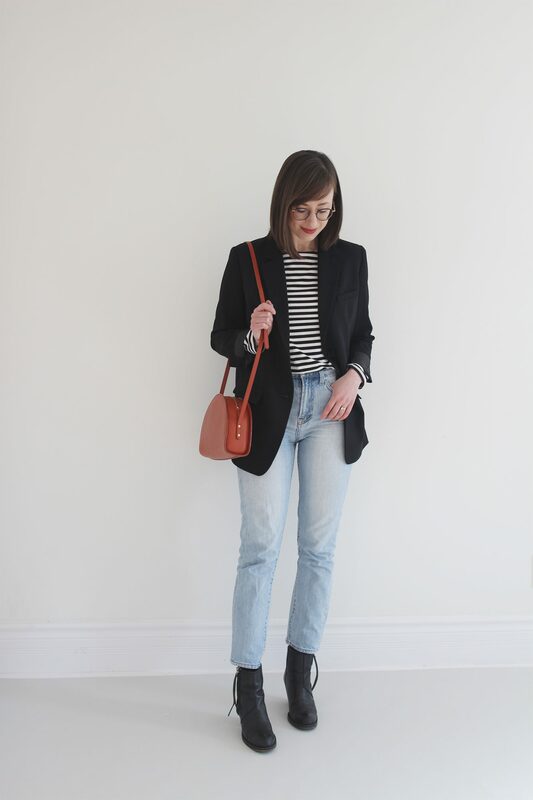 I think starting on a friday–or even a thursday –and incorporating weekend pieces like jeans in the mix is probably what I need to do, since that way its fewer work days of wearing the same things and more of chance to mix pieces. I also took time to take care of each piece carefully, and I also found myself really appreciating all of my choices. Those things don’t happen when your whole closet is before you! 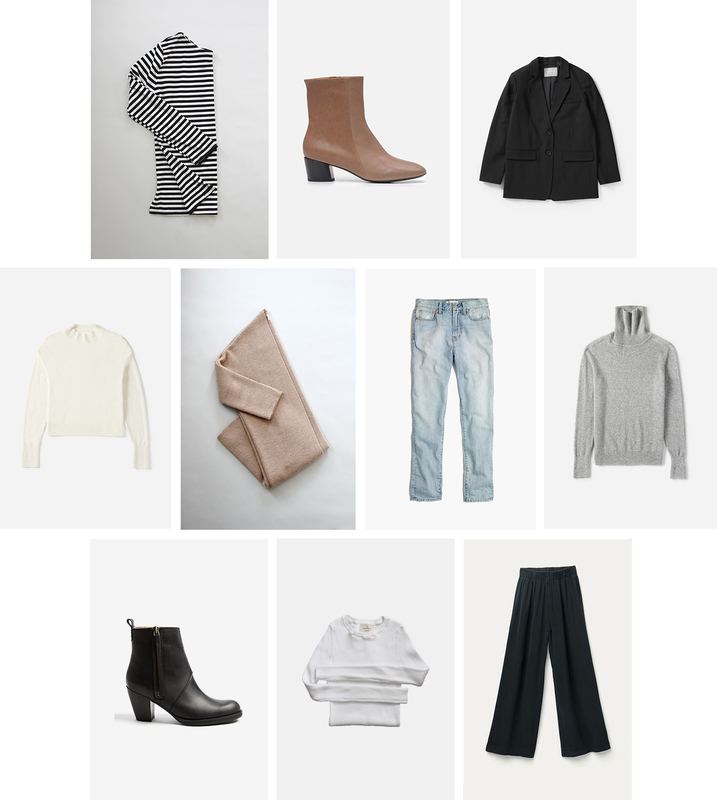 Because of the versatility I discovered, I am choosing to hold off on the additional “fall/winter” pieces that I thought I needed, and revisit those needs next fall. 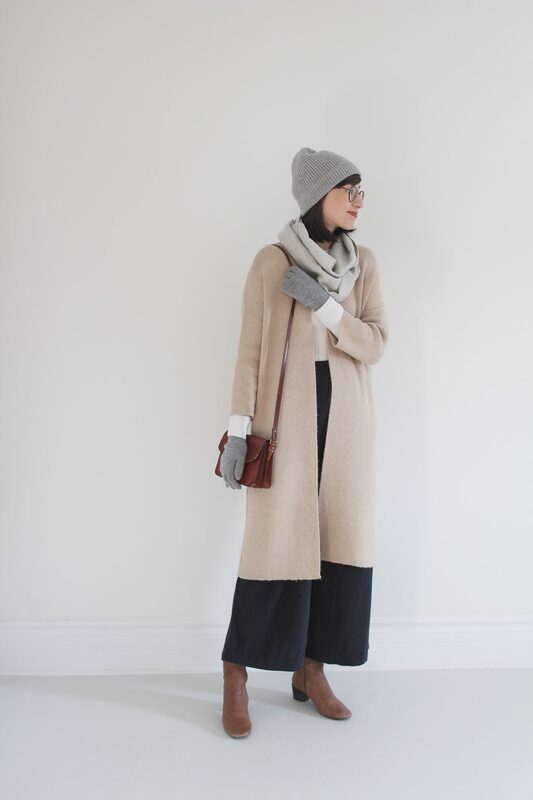 Instead, I will wear what I have and wait for spring to add a couple new things! Please say you are doing another 10×10 in the Spring so that I can complete a challenge this time! Thanks so much for your lovely writing, creativity, and outfit inspiration!! Thanks for including the Insta handles of participants that stood out to you. I followed them all! Wow, I’m so tickled to have my little quote in your beautiful space! Thanks for another fantastic round of 10×10 fun, a useful reflection, and for being such a stylish and lovely lady! Great wrap up, Lee! I always love reading everyone’s reflections at the end because I undoubtedly find something I hadn’t even considered to think about with my own 10×10. Like you, I think this was my ‘safest’ 10×10 yet. I had originally planned to push myself outside of my comfort zone, but when I tried to choose my pieces that way I was left unexcited about it. So, I took a day or two break and then went back into my closet without any expectations of what I should grab. I went with my instincts and ended up with some of my very favorite items. It made this round somewhat seamless and so fun! Thanks again for bringing together such a widespread group of women to participate. I LOVE it! This was my first time, and I really enjoyed it:) Especially engaging more with the clothes I already have, and putting the effort in each day (which I don’t always do). And just playing around with the items, wearing it open or closed etc. And like you mention the ease of a limited selection to choose from. 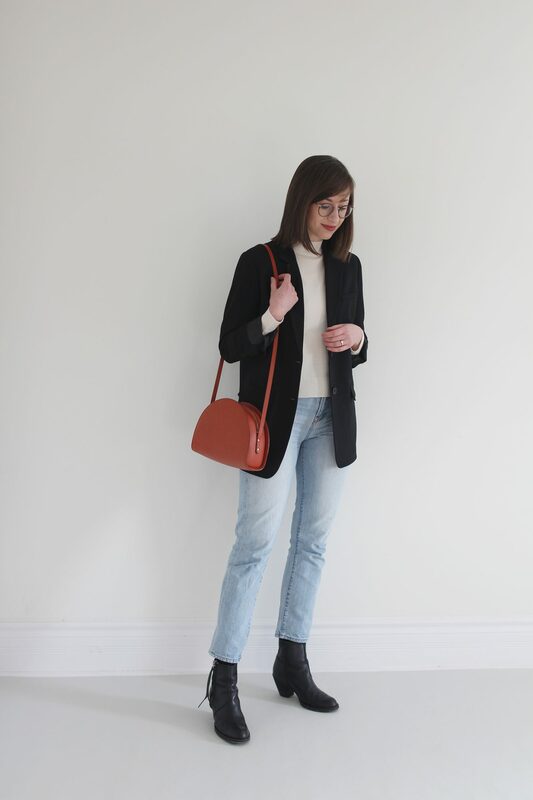 What I thought might be difficult about this challenge and also about a possible capsule, is that I don’t want to pair a lot of my items together – I love wearing black with 1 item in another colour or print, so I would not pair those coloured items together. I did make it to the end though with 10 outfits, so maybe it is versatile enough. How would you approach this, maybe a 2-part capsule? I also found it not as easy to get engaged in the 10×10 community, perhaps because I never used instagram actively before so no network there yet. I did enjoy scrolling through the feed though of others who were in it with me. I loved every one of your outfits, Lee and I so appreciated you posting all of them on your Instagram feed, so that I could see them all together. 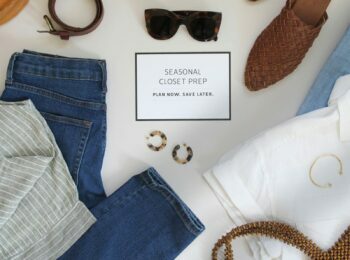 Will you be including any or all of these items in your 3 month capsule closet? Thank you so much Carol! I’ll definitely be including most of these items in my capsule closet 🙂 The list is getting long though!